Managing a data center is a big job. Additionally, it is without question one of the most important elements of your high-tech organization. A data center contains all the information that is required to run your company from day to day; everything that’s required for short term and long term operation is stored securely in its electronic archive. This information is valuable for many reasons. A considerable amount of highly sensitive proprietary data is stored in an organization’s data center. If the hardware that stored this information was ever physically damaged or illegally accessed by hackers or data thieves, your organization could lose information worth hundreds of thousands – even millions – of dollars. The records of your customers and employees are also probably stored electronically in your data center. These people have trusted you with some of their most personal information. You have to do right by them; a secure and well-maintained data center is going to help you do exactly that. One of the most important forms of data center maintenance is the installation of a data center battery system. This system is a powerful energy backup that will provide essential electrical power to your data center in case its usual energy source is cut off. Even the most stable and reliable data center can lose all of its data due to a sudden power outage. The financial and legal repercussions of lost data might be severe, not to mention the loss of time, effort, and reputation your organization will suffer as a result of lost or damaged information. As you can see, the presence of a data center batter system is an absolute requirement for any organization. There are a number of steps involved in the installation of a battery system. Any company that provides data center maintenance services will be able to plan, install, and maintain your battery system, so you would be well-advised to talk with one of these companies. All companies with experience in data center maintenance will have extensive industry experience and insight into the design and installation of all kinds of data centers and battery systems. 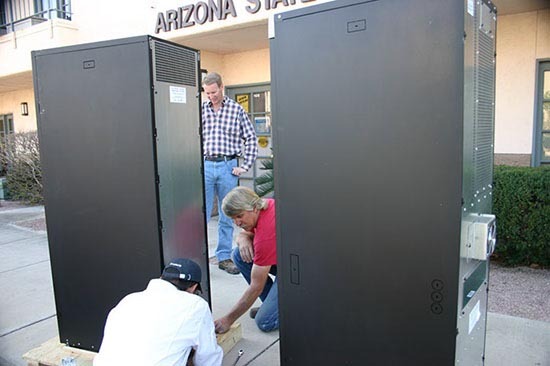 The design and installation team will work closely with your organization to implement the best data center battery system. Before a battery system can be installed, it has to be designed. This step will require an in-depth survey of your existing data center. All the hardware components must be carefully mapped and, if necessary, a power use survey will be conducted. Once the preliminary information has been collected, then the battery system components will be assembled. Many data center maintenance companies have the ability to fabricate custom pieces for your data center. It’s very important that your data center receive the elements that will exactly fit it; otherwise the power backup won’t work correctly. The installation of the battery system elements may take a little time, depending on the size of your organization’s data center. Once the installation is complete, the battery system will be tested and if everything goes smoothly, your organization can bring the battery system online. You won’t have to ever worry about the devastating effects of data loss. A data center maintenance company can provide you with all the technical support your organization requires. From center design to battery system installation, a data maintenance company can do it all. This entry was posted in data center maintenance, Uninterruptible Power Supply and tagged data center battery systems, data center maintenance, data center power management. Bookmark the permalink.